Expansion joints are primarily used to absorb all directional piping movements as well as reduce noise and vibration. In addition, they are a cost effective means to relieve piping and anchor stresses, compensate for misalignment, and provide access to piping and equipment. General Rubber’s Maxi-Joint® wide arch expansion joints provide superior movement capability in axial compression, axial extension, and lateral deflection, as well as in the angular and torsional direction. This performance cannot be obtained with metallic joints, grooved couplings, or large pipe loops. The low stiffness and deflection forces make designing with General Rubber expansion joints a breeze. 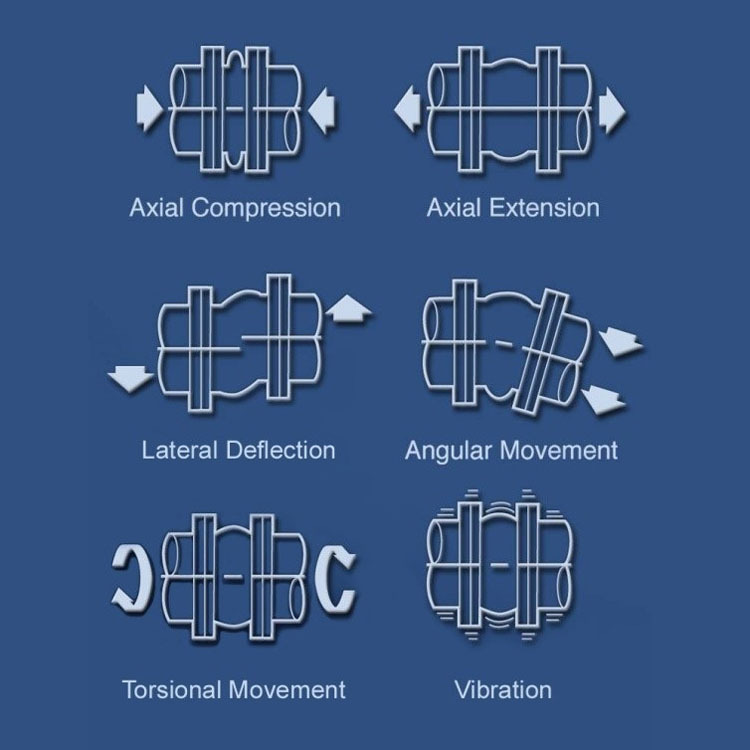 General Rubber’s expansion joints and flexible connectors effectively dampen and insulate against the transmission of noise and vibration generated by mechanical equipment. This is particularly important in HVAC applications where the disturbing frequency of pipe and fluid-conducting noise can resonate and amplify throughout the building. Metallic joints and grooved couplings do little to reduce noise and vibration. General Rubber's expansion joints have a cycle life in the tens of millions. The highly compliant and resilient characteristics of General Rubber expansion joints make them ideally suited for earthquake and bomb blast isolation, as well as pressure-surge and water hammer dampening. Our abrasion and corrosion resistant materials can be superior to even the most exotic materials. General Rubber is proud to offer a variety of elastomers and construction materials chosen specifically to meet the needs of even the most demanding applications. Thermal movements along with other external forces and displacements, including ground settlement can quickly exceed allowable pipe and anchor stresses. General Rubber expansion joints absorb these stresses and replace them with their own low stiffness (spring rate). It is common in both new construction and replacement applications to encounter pipe misalignment. Minor misalignment can be taken up with standard General Rubber expansion joints, and custom units can be quickly fabricated with large permanent offsets. Access to piping and equipment can be easily achieved by treating the expansion joint as a removable spool piece. If a self-retracting design is needed, General Rubber’s Style 5100D dismantling joint can be utilized.